All right, it’s time to stop the Fukushima hysteria. At the present time, the people of Japan are struggling to deal with one of the most serious natural disasters anywhere in the world in recent recorded history. My thoughts are with them. But I’ll get straight to the point. All right, what do we actually know about the effects of this disaster on Unit 1 at the Fukushima I Nuclear Power Station? There are 53 operational nuclear power reactors in Japan today. Most of them were operating normally at the time of the recent earthquake, and continued to operate normally, since they were relatively far away from the earthquake’s epicenter. Some of them were offline at this time for routine scheduled maintenance or refueling. Several reactors, closer to the earthquake’s epicentre, experienced normal, automatic reactor trips (“SCRAMs”, in Western nuclear engineering parlance) controlled by the RPS (the Reactor Protection System), exactly as you would expect either in the presence of ground acceleration under earthquake conditions, or due to a loss of electricity grid connectivity to the plant (which is known as a Loss of Offsite Power, or LOOP, in nuclear power engineering parlance), which is a very likely event during a severe earthquake. For the purposes of designing safe nuclear power plants, loss of offsite power is recognized as a relatively frequent, relatively high probability event. For the purposes of designing safe nuclear power plants, especially in Japan, it is recognized that the plant can be subjected to a severe earthquake – and on the Japanese coast, to tsunami surges as well. 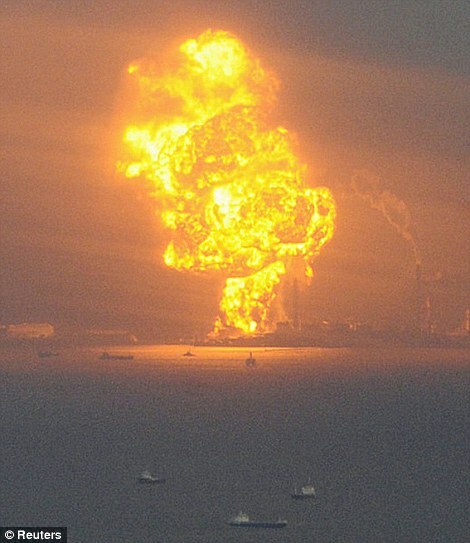 Meanwhile, oil refineries and natural gas plants are pretty much all going up in flames in Japan’s earthquake-affected areas. The absolute worst case scenario that we could potentially be looking at here is partial melting damage to the nuclear fuel – similar to the Three Mile Island accident. This will not harm any people or harm the environment, but it will have serious financial and political costs for TEPCO, it may write off the reactor, and it will be a significant political and rhetorical advantage for anti-nuclear activism and FUD. If there is any real environmental damage to come out of this accident, it will come as a result of increased use of coal and fossil fuels instead of nuclear energy. Fukushima I-1 is a General Electric BWR (Boiling Water Reactor), with a (relatively small) nameplate capacity of 460 MW. It first achieved criticality in October 1970, only 3 years after its construction commenced in 1967. Fukushima I Unit 4, Unit 5 and Unit 6 were all already offline for maintenance and fueling operations at the time of the earthquake, and Units 1, 2 and 3 were shutdown automatically at the time of the earthquake, either by the RPS seismic sensors or by the RPS relays opening when off-site power was disrupted, completely as intended. The control rods are all already fully driven into the reactors, and the reactors are fully subcritical. The systems are not even close to criticality and cannot reach criticality – or any measure of supracriticality – at all. This has been the case at all times following the initial RPS trips and control rod insertion at the time of the earthquake. However, for a limited period of time following reactor shutdown, cooling of the reactor core still has to be maintained, to dissipate the decay heat of the short-lived fission products in the nuclear fuel. And that cooling, and how it is maintained, or not maintained, in the absence of offsite power, is at the root of our discussion of all this fuss at Fukushima. Even with the reactor in a subcritical configuration, with control rods inserted, if the reactor core coolant level drops excessively and it is not replenished, over the course of the next 48 hours or so following reactor shutdown, the fuel can eventually heat up excessively from its decay heat, leading to core damage – partial melting of the fuel, which will be very difficult and costly to fix. This is not significantly dangerous for the people and the environment around the nuclear reactor. This worst-case scenario, damage to the fuel in the reactor core, is not dissimilar to the damage to the Three Mile Island Unit 2 PWR in the United States in 1979; although it is worth noting here that the TMI reactors are Pressurized Water Reactors and the Fukushima reactors are BWRs. As the name suggests, however, the decay heat will decay away fairly rapidly – and the fuel’s thermal power output will drop below levels which are potentially problematic in the absence of proper cooling after a few days. It will take a few days for the fuel rods to stabilise their own temperature, in the absence of active water cooling, as the short-lived fission products in the fuel which are generating the heat continue to decay. The reactor will be then in what is known as “cold shutdown”. At that point, only minimal coolant injection into the reactor will be required, and preparations can be began to remove the nuclear fuel from the core. We’re probably already not far from reaching this point, chronologically, at Fukushima I-1. The decay heat from the fission products in the fuel has been decaying constantly for the last couple of days, ever since control rod insertion at the time of the earthquake. We’re now reaching the point, over the coming few days, where the risk of further potential core damage has passed. Following LOOP, most of a reactor’s instrumentation and emergency systems are generally transferred to a backup auxiliary power supply provided on site by diesel generators, or to batteries in the case of some systems. However, it appears that these generators at Fukushima I-1 were damaged by the earthquake. The diesel generator appeared to start up correctly, and then it stopped abruptly about an hour later. So, what happens to a BWR, in terms of its decay heat removal, when the reactor is tripped, and offsite power is offline, and the auxiliary electric power supply from the diesel generators is offline? To find out, we need to take a closer look at the BWR. To start with, here are a few little diagrams that basically illustrate the architecture of a typical BWR of the kind we’re discussing here. Click through for the full-sized images. Wikipedia has a surprisingly good page on the safety systems of a Boiling Water Reactor, and I think that’s a very good place to start. It’s not too technical, since it is Wikipedia, after all, but it’s impressively good basic technically literate material for a Wikipedia article. Like all light-water reactors, the GE BWR has a negative void coefficient. In other words, as the proportion of steam to liquid water increases within the reactor, the moderation of neutrons within the reactor is decreased, since the lower-density steam is less effective as a moderator, and the reactor’s average neutron energy spectrum hardens a little, and this causes the reactor’s neutronic power output to decrease, since the reactor is operating with an enriched uranium fuel in a typical neutron energy spectrum where hardening the neutron energy spectrum will decrease the fission power output. A sudden increase in steam pressure within the BWR (caused, for example, by the closing of the main steam isolation valve from the reactor) will cause a sudden increase in the proportion of liquid water to steam within the reactor, which will cause an increase in the reactor’s power output, due to the negative void coefficient. Such an event is known as a pressure transient. The BWR is specifically designed to suppress such pressure transients, by safely venting the overpressure through safety relief valves to below the surface of a pool of liquid water within the containment. This toroidal-shaped tank, known as the torus, is shown on the drawings above. There are 11 safety overpressure relief valves on the older generation of BWRs such as the ones at Fukushima, and only a couple of them need to be opened in order to completely mitigate a pressure transient. Although a pressure transient will cause a transient in the fission power output for a brief moment, the rapid actuation of the pressure relief valves will cause the pressure to drop off rapidly, and correspondingly, the neutronic power will rapidly drop off once the valves are opened, to a level far below nominal operating power. There is an intrinsic physical relationship between temperature, pressure and fission power output in a light-water reactor, because of the void reactivity coefficient. The Emergency Core Cooling System, the ECCS, of a light-water reactor is made up a set of many interrelated, redundant layers of different safety systems which are designed to protect the nuclear fuel within the reactor pressure vessel from overheating in the event of the loss of coolant level, by maintaining that coolant level. To understand what’s going on at Fukushima, it is good to have a basic understanding of what these different systems are. The High Pressure Coolant Injection System (HPCI) is the first line of defense in the ECCS. The HPCI is designed to inject substantial quantities of water into the reactor while it is at high pressure, and to prevent the activation of the additional, redundant low-pressure “layers” of the ECCS. HPCI can deliver approximately 19,000 L/min to the core at any core pressure above 690 kPa (100 psi). This is usually enough to keep the water levels sufficiently high to avoid activating the low-pressure “layers” of ECCS except in a major contingency, such as a large break in the makeup water line. The HPCI necessarily operates at a high pressure because it injects water into the reactor at a high flow rate against the high pressure already within the reactor, without releasing that pressure. It’s worth noting here that whilst the Fukushima reactor may be losing coolant level at a limited rate through steam venting through the pressure relief valves into the torus, there is no pipe break, no stuck-open valve, or any other serious large-scale LOCA scenario here with a serious rate of coolant loss, which is the kind of thing the ECCS is designed to safely compensate for. The HPCI system is powered by steam from the reactor – its operation is not dependent on off-site power, or power from the diesel generators, or battery power. It is powered by the heat remaining in the reactor itself. It is completely plausible that a turbine trip, with sudden closure of the main steam isolation valve (MSIV) between the reactor and the turbine hall, will cause a significant power transient in the reactor, for the reasons described above, and steam venting into the relief valves as a result of that transient will cause some loss of the coolant level. The HPCI system is more than adequate to make up the reactor water level in this scenario. The next one of the redundant components of the ECCS is the Reactor Core Isolation Cooling System, or RCIC. RCIC is also one of the high-pressure coolant injection systems, capable of injecting approximately 2000 L/min of water into the reactor core. The RCIC is able to operate with no source of electric power other than battery power, and is capable of providing decay heat removal by itself in the event of a station blackout, where off-site power is lost and the backup power supply from the diesel generators also fails. If the water level cannot be maintained with the HPCI and/or the RCIC, and the core water level is still falling below some present point even with these systems working full-bore, then the next systems in the stack of ECCS systems respond. If, for some reason such as a large-break LOCA, the water level cannot be maintained, we then move to looking at the next layers of redundancy in the ECCS – the depressurisation and low-pressure coolant injection systems. For the low-pressure coolant injection components of the ECCS to operate, the pressure within the reactor must be reduced, by the depressurization system. The Automatic Depressurization System (ADS) is designed to activate in the event that the reactor pressure vessel is retaining pressure, but the water level cannot be maintained using high pressure cooling alone, and low pressure cooling must be initiated. When the ADS activates, it rapidly releases pressure from the reactor vessel in the form of steam, through pipes that are piped to below the water level in the the torus, which is designed to condense the steam released into it, bringing the reactor vessel pressure below 32 atmospheres, allowing the low pressure components of the ECCS to be activated. The low-pressure ECCS systems have extremely large capacities compared to the high pressure systems and are powered by multiple different power sources. They will maintain any required water level, and in the event of a worst-case LOCA, such as a break of a large water pipe feeding into the reactor vessel below core level, which could potentially lead to temporary fuel rod “uncovery”, they will rapidly return the water level over the fuel in the core prior to the fuel heating to the point where core damage could occur. The Low Pressure Core Spray System (LPCS) is the first of the low-pressure ECCS components, designed to suppress steam generated by a major contingency. As such, it prevents the reactor vessel pressure from re-increasing above the LPCI coolant injection pressure, 32 atmospheres. It activates while the pressure in the reactor is still below 32 atmospheres, and delivers approximately 48,000 L/min of water in a deluge from the top of the core. The Low Pressure Coolant Injection System, LPCI, is the final piece of the ECCS, the “heavy artillery” in the ECCS. Consisting of 4 pumps driven by diesel engines, it is capable of injecting a mammoth 150,000 L/min of water into the core. Combined with the core spray system to keep steam pressure in the core sufficiently low, the LPCI can suppress all core-cooling contingencies by rapidly and completely flooding the core with coolant. One should also note that the diesel-engine driven pumps that run the LPCI are completely independent of off-site electrical grid power, they are independent of steam power being extracted from the reactor (unlike HPCI), and they are independent of the diesel generators that provide the backup electricity supply for the plant in the event of the loss of offsite power. The SLCS is a system that is never meant to be activated unless all other measures have failed to maintain integrity of the nuclear fuel. In the older generation of existing BWRs its activation could cause sufficient damage to the plant (due to the salts used as neutronic poisons causing corrosion and contamination of the whole nuclear steam supply system) that it could make the reactor inoperable without a complete overhaul. There is now talk of pumping seawater into the reactor building; although the information in the press on this subject seems to be vague and confused. There is very little good, unambiguous information out there. Are we talking about spraying seawater within the reactor building, in order to condense steam and reduce the temperature and pressure? That seems to make sense. 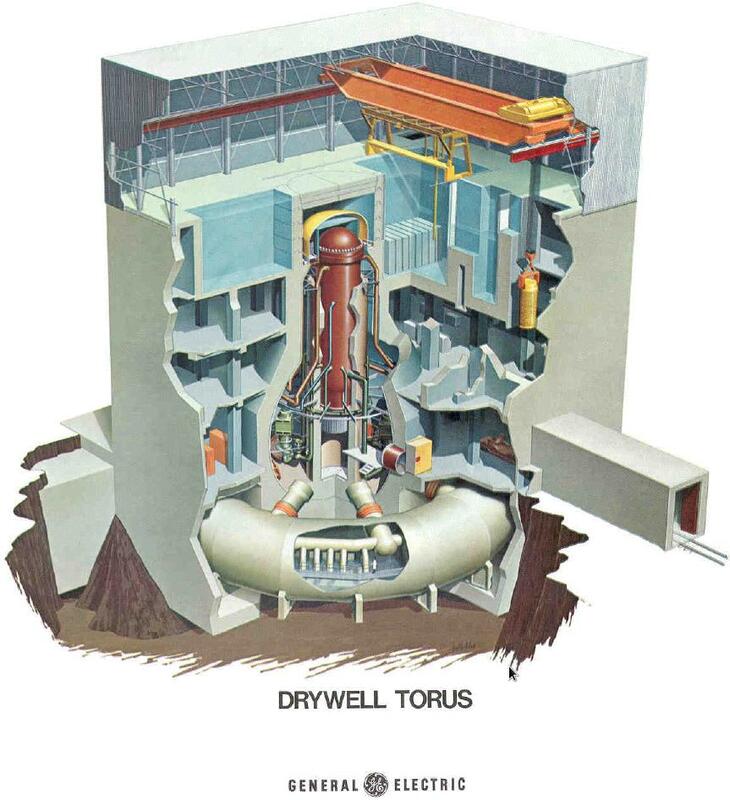 Are we talking about spraying seawater within the drywell to help cool the reactor pressure vessel, and reduce temperatures within the drywell? That also makes sense. Surely it wouldn’t make sense to actually inject seawater within the actual Nuclear Steam Supply System, would it? This would cause significant problems with regards to contamination and corrosion of the entire nuclear steam supply system, which would be difficult, time consuming and expensive to rectify. Why would this ever be considered, when the SLCS and the ECCS systems are designed to perform the same function, safely and reliably, under adverse emergency conditions, without ruining the reactor? I do not expect that this is actually what is being planned – but again, the information that is tricking out through the hysterical mass media is so bad, it’s hard to tell. The Design Basis Accident (DBA) for a nuclear power reactor is the most severe possible single accident that the designers of the plant and the regulatory authorities could realistically imagine, as a contingency which the operators of the plant must be able to handle. It is, also, by definition, the accident the safety systems of the reactor are designed to respond to successfully, even if it occurs when the reactor is in its most vulnerable state. 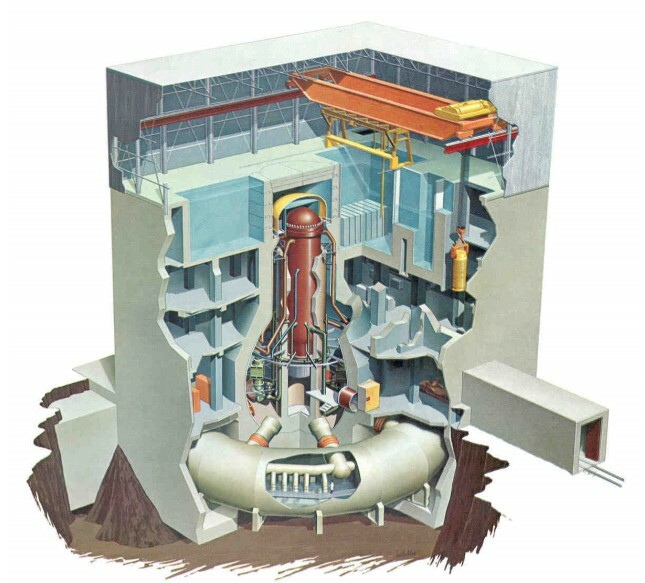 The DBA for the BWR consists of the total rupture of a large coolant pipe in the location that is considered to place the reactor in the most danger of harm – specifically, for the older generations of existing BWRs, such as the Fukushima BWRs, the DBA consists of a “guillotine break” in the coolant loop of one of the recirculation jet pumps, which is substantially below the core waterline, and as such, has the makings of a very serious Loss of Coolant Accident or LOCA. The DBA scenario combines this large-scale loss of coolant with a simultaneous loss of feedwater to make up for the water boiled in the reactor (a loss of proper feedwater or LOFW), combined with a simultaneous collapse of the regional power grid, resulting in a loss of power to certain reactor emergency systems, or LOOP. The BWR is designed to shrug this accident off without core damage. The Design Basis Accident is not directly relevant to what happened to the reactor at Fukushima, but it is a good example to use to illustrate how the various different layers of the ECCS and the Reactor Protection System work under severe accident conditions, which is important background to a good understanding of what happened at Fukushima. The immediate result of such a large-scale pipe break (we’ll call this time T+0) would be a pressurized stream of water well above boiling point shooting out of the broken pipe into the drywell, which is at atmospheric pressure. As this water stream flashes into steam, the pressure sensors within the drywell will report a pressure increase to the Reactor Protection System, within no more than 300 milliseconds; that is, by T+0.3. The RPS will interpret this pressure increase signal as the sign of a break in a pipe within the drywell. As a result, the RPS immediately initiates a full SCRAM, closes the Main Steam Isolation Valve (isolating the containment building), trips the turbines, attempts to spin up RCIC and HPCI using the residual steam, and starts the diesel-driven pumps for LPCI and the core spray. Now, let’s assume that the LOOP occurs at this time, at T+0.5. The RPS is on an uninterruptable power supply, so it continues to function. The RPS immediately detects the loss of offsite power, however, and already enters a fully defensive state and trips the reactor and the turbine, if it has not already. Within less than a second from power outage, auxiliary batteries and compressed air supplies are starting the emergency diesel generators. Power will be restored by T+25 seconds. Due to the rapid escape of coolant from the reactor core, HPCI and RCIC will fail rapidly due to loss of steam pressure, but this is immaterial, as the 2,000 L/min flow rate of RCIC available after T+5 is insufficient to maintain the water level; nor would the 19,000 L/min flow of HPCI, available at T+10, be enough to maintain the water level, even if it could work without steam, in the event of such a serious LOCA. At T+10, the temperature of the reactor core, at approximately 285 °C at this point, begins to rise as enough coolant has been lost from the core that voids begin to form in the coolant between the fuel rods and they begin to heat rapidly. By T+12 seconds from the initial LOCA, fuel rod uncovery begins. At approximately T+18, parts of the rods have reached 540 °C. At T+40, the core temperature is at 650 °C and rising steadily; the LPCI and the pressure-regulating core spray kick in and begin deluging the steam above the core, and then the core itself. A large amount of hot steam still trapped above and within the core has to be knocked down first, or the water will be flashed to steam prior to it hitting the fuel. This happens after a few seconds, as the approximately 200,000 L/min of water these systems release begin to cool first the top of the core, with the LPCI deluging the fuel rods, and the core spray suppressing the generated steam until at approximately T+100 seconds, when all of the fuel is now subject to this deluge and the last remaining hot spots at the bottom of the core are now being cooled. The peak temperature that is attained in the fuel elements in this scenario, even with temporary uncovery of the fuel rods, is 900 °C, well below the maximum of 1200 °C which is acceptable before fuel damage begins, at the bottom of the core, which was the last hot spot to be cooled by the water deluge. The core is now cooled rapidly and completely by the LPCI, and following cooling to a reasonable temperature, below that consistent with the generation of steam, the core spray is shut down and the LPCI flow rate is decreased to a level consistent with maintenance of a steady temperature of the fuel rods, which will drop over a period of days due to the decay in fission-product decay power output within the fuel. After a few days, decay heat will have sufficiently abated to the point that defueling of the reactor is able to commence. Following defueling, LPCI can be shut down completely. On March 12, there was an explosion near the Fukushima I-1 reactor building. What happened? There are about 5 different layers of containment which exist, in a power reactor reactor like the ones at Fukushima, between the people outside and the potentially dangerous radioactive fission products within the nuclear fuel. The fuel rods themselves are clad in tubes of zirconium alloy, and that represents one such layer. That nuclear fuel is inside the reactor pressure vessel, which is made of steel six inches thick, and that reactor vessel is the next such layer. The reactor pressure vessel is within the primary containment vessel, the drywell, which is made of steel one inch thick, and that represents the next such layer. The primary containment vessel is within the secondary containment structure, which is made of steel-reinforced, pre-stressed concrete between 4 and 8 feet thick. The reactor building which is built around the secondary containment structure is the last of these multiple layers of containment, and it is also made of steel-reinforced, pre-stressed concrete, between 30 cm and 1 m thick. If every possible measure standing between safe operation of the plant and severe core damage and melting of the nuclear fuel fails, the containment can be sealed indefinitely, and it will prevent any significant release of radioactivity to the outside environment occurring under any circumstances. Now, let’s look at some diagrams of these structures. Click-through for the full resolution images. The outermost layer of the multiple layers of containment – the reactor building – has walls and a roof made of solid concrete, and it’s roughly cube-shaped. On top of the concrete reactor building, however, there is an additional part of the structure – it is not made of concrete, but it is made of steel, with steel sheets over a steel frame. This steel building on top of the reactor building houses the fuel transfer crane, and it is built on top of the concrete roof of the reactor building. 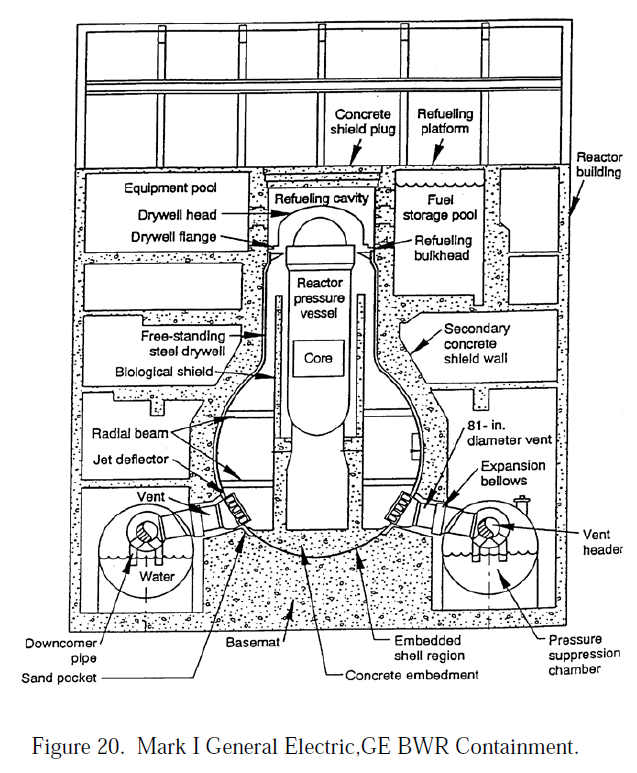 I’m referring to the part of the structure above the concrete shield plug and the refueling platform at the top of the concrete reactor building, as shown on the first of the diagrams above. It is this relatively weak steel structure on top of the reactor building, which is not really part of the reactor building proper, which seems to have been blown out by a hydrogen explosion. The explosion at Fukushima I-1 does not appear to have occurred within nor does it appear to have breached any of the fundamental layers of containment structure described above. Now, an explosion has not occured as a result of a release of nuclear energy. That is a scenario that is simply outside the laws of reality. An explosion can be caused by one of two things; a chemical explosion, such as an ignition of a hydrogen-oxygen mixture, or a sudden release of stored gas or steam pressure. It appears that the structure has probably been damaged as a result of a hydrogen explosion. It’s probable that excessive hydrogen generation within the reactor core, either radiolytically or chemically by reduction of water in the presence of the zirconium cladding at significantly elevated temperatures, has been vented into the torus, and as temperatures and pressures have began to rise within the torus steam pressure in the torus has been vented out into the reactor building surrounding the torus. From there, the hydrogen mixed with that steam and water vapor has risen, as hydrogen does, and worked its way through the reactor building, escaping at the top of the reactor building, and accumulating at the top, in the area around the fuel transfer crane. It appears that the accumulated hydrogen has then mixed with air and exploded. When a light-water reactor is operating, some of the oxygen-16 in the water is activated into radioactive nitrogen-16, by the 16O(n, p)16N reaction. 16N is very short lived, with a half-life of only 7 seconds, but its specific activity is correspondingly very high. When a BWR nuclear power station is operating, the entire nuclear steam supply system, including the turbine hall, is a radiological controlled area, due to the radioactivity from 16N. However, after reactor shutdown, the 16N decays very quickly, reducing the radiation dose around the turbines to negligible levels basically immediately. This is one key difference between a BWR power plant and a PWR power plant – since the secondary coolant loop that drives the turbine in a PWR is isolated from the reactor’s primary coolant by the steam generator, the secondary coolant is never radioactive during reactor operation. There can also be very small amounts of other radionuclides formed within the reactor coolant, for example tritium, which is formed by the fission of boron used as a soluble reactivity shim in the reactor coolant (if you really want to know: neutron capture on 10B forms an excited state in 11B, which splits apart into two 4He and 1 3H nuclei. A similar reaction occurs beginning from 11B, with the re-emission of one additional neutron in the breakup of the excited 12B nucleus), and 14C, which is formed from nitrogen compounds such as hydrazine which are added for pH control and oxygen scavenging in the reactor coolant. If excessive pressure within the torus or within the primary containment vessel is vented out into the reactor building, and from there it is allowed to escape out into the atmosphere, then small amounts of these radionuclides may be released out into the atmosphere, which is a possible scenario we might be seeing at Fukushima. We will know, over the next few days, exactly what the true situation is regarding the composition, and quantity, of any releases of radionuclides into the outside environment. It’s very easy to detect radioactivity, to measure it quantitatively with high precision, and to discriminate the presence of different radionuclides and identify them. What I suspect we might see from some anti-nuclearists, however, is something that we saw after Three Mile Island, and something that we still see on rare occasions up to the present day in regards to TMI – the conspiracy theories. Some people will probably try and claim that there were actually enormous releases of radioactivity into the environment and it was never really measured or documented – or that it was measured and known that there were huge releases of radioactivity into the environment at Fukushima, but there’s a big conspiracy by big bad unethical TEPCO or by the Big Bad Nuclear Industry in a more general sense (and by the evil government and the conspirators at the IAEA, and the armies of Big Nuclear Shill bloggers, of course!) to cover it all up! We saw this once or twice after TMI, and I think we’ll see it again from those who are truly devout believers in the absolute, unmoderated evil of the Big Bad Nuclear Industry. Of course, that’s absolute nonsense, for exactly the same reasons that it’s nonsense in the context of TMI. You simply cannot ever, in any context, release a very large amount of radioactivity into the atmosphere and cover it up or keep it quiet. Nuclear power plants and other facilities that use radioactive materials are all over the place in our society, and they all have sensors and instruments to make sure everything is safe and radioactive contamination does not occur. If a Chernobyl-style event occurs, you will detect it at any such site. Any nearby NPP. Any nearby molecular biology lab working with radiolabels. Any nearby physics lab. Any nearby clinic working with X-rays or medical imaging. Anyone nearby developing photo film. If a person who has recently had a radiopharmaceutical medical imaging procedure walks into a nuclear power plant or physics lab, or a radiation detector installed at a border crossing or port around the USA, they’ll set off alarms. Radioactivity is so easy to detect that in 1896 Becquerel discovered it accidentally. I remember that there was a case, in November of 2008 I think, where a little bit of radioactive 133Xe was vented from the ANSTO Lucas Heights radiopharmaceuticals facility… this was quickly detected in Melbourne by the atmospheric radiochemistry monitoring station which is part of the network being developed for the CTBTO for CTBT verification… one of a large network of such sites, which are extremely sensitive, all around the world which are used to detect any possible nuclear weapon test. Japan, and Hong Kong and mainland China have plenty of expertise and infrastructure that they can use to, for example, perform the sensitive analysis of fission-product radionuclides in the atmosphere to monitor nuclear weapons testing and nuclear fuel processing in the DPRK… so they can also certainly analyse the presence of traces of artificial radionuclides in the atmosphere from this nuclear power plant incident. How many nuclear power stations are there in the United States that are located relatively close to TMI, in the states geographically around TMI? What did their radiological monitors show? Anything? Photographic films from everyone around the area was collected and looked at – no radiation was recorded. Basically, the whole idea of such an enormous cover up is just an enormous, impractical conspiracy theory – which would need to involve the state government, the federal government, the nuclear energy industry, and huge numbers of the public and huge numbers of scientists and industries – like an Apollo hoax conspiracy theory. We will know, over the next few days, exactly what the true situation is regarding the composition, and quantity, of any releases of radionuclides into the outside environment. There are no coverups or conspiracies in this context – there simply cannot be. I hope you’ve found this post informative. Please feel free to post comments, with any further discussion, questions, criticisms or what-have-you. I will likely follow up this post with a future post, following future developments of this issue, and responding to questions or new information as it comes to hand. Just a note – the Dai-ichi reactor was due to be decommissioned on March 25th… so having the reactor decommissioned 2 weeks early will harfdly cause much of a financial hit! well… the 7th fleet moved and Reactor #2 is expected to blow. What’s next? As someone living in Tokyo for the last 14 years I feel that hysteria is pretty much justified. Even though modern engineering could theoretical handle all contingencies, the proof of the pudding is in the eating. Engineering Hubris – I recommend reading Homo Faber to remind people the role of chance (or even fate), if this is required after the financial crisis and the Oil Disaster in the Gulf of Mexico. However, appreciate your technical explanation! Excellent accurate article, I wish the news media would publish the truth and stop trying to induce fear in the public with all of the “big bomb” BS. I was embarassed watching the news last night, knowing the American people are so uneducated concerning basic nuclear physics that they are believeing everything that is being said. CNN even compared this to Bopal India, that wasn’t even nuclear, it was hydrocyanic acid. Please try to get this out to the mainstream media. Nice content! this articles are very informative. after reactor shutdown,”The 16N decays very quickly, reducing the radiation dose around the turbines to negligible levels basically immediately”. ‘The reactor’s primary coolant by the steam generator, the secondary coolant is never radioactive during reactor operation”. I think this lines are too much important. Thanks! They’re not supposed to be called ‘fault lines’… the proper terms is ‘faults’. according to Wikipedia with reference to USGS (30 April 2003). “Where are the Fault Lines in the United States East of the Rocky Mountains?”. Retrieved 6 March 2010. But lets not be pedantic. Nuclear power points should not be built there. We don’t yet have enough information on whether the quake caused enough damage to justify your conclusion, Patrick. Also, I can’t help but think that if it’s “safe” to have massive highrise-filled cities like Tokyo so near to a fault, then it can’t be that hard to secure a squat block of concrete that can be just about as thick, heavy and shot through with rebar as you like. Plus, those cities need to get power from somewhere. Excellent technical article, that concentrates its analysis mostly on the core. I’ve read that fuel cooling pools could be a bigger problem in the long terms (http://www.nytimes.com/2011/03/15/world/asia/15fuel.html). Can someone please clarify whether fear is thus justified? there are five different types of burner and when they should be used). doesn’t build up on the cooling element.